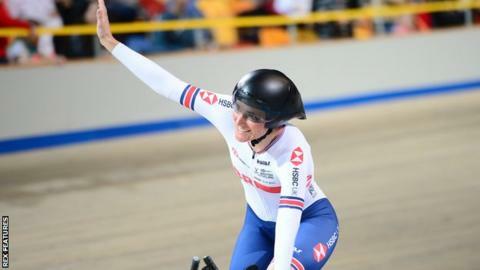 Great Britain claimed five gold medals and one silver on the third day of the Para-cycling Track World Championships in the Netherlands. Sarah Storey, a 14-time Paralympic champion, defended her WC5 3km individual pursuit title in Apeldoorn, before claiming scratch race gold. Sophie Thornhill and pilot Helen Scott won the WB 1km time trial before James Ball and Pete Mitchell claimed a surprise gold in the men’s event. Katie Toft won C1 scratch race gold. In the men’s MC4 individual pursuit, Britain’s George Peasgood claimed a silver medal after being beaten by world and Paralympic champion Jozef Metelka of Slovakia. Toft’s win saw her claim her second medal of the week after her victory on the opening day in the WC1 3km pursuit. Toft also won the omnium but as it is a test event at this year’s World Championships, no medals were awarded. Storey, 41, also won silver in Friday’s 500m time trial. Ball and Mitchell earlier beat defending champions and fellow British duo Neil Fachie and pilot Matt Rotherham to take home MB 1km time trial gold. They had a disrupted build up to their race when, on their first attempt, the chain on their bike broke as they came out of the start gate. Their second attempt was much more successful, seeing them win their first world title. “I can’t believe it, we’ve worked so hard for that. I’m so happy,” 27-year-old Ball said. Great Britain won three gold medals on the opening day of the event, while Lora Fachie and Corrine Hall claimed 3km pursuit bronze on Friday.